Farmer Signs understands the importance of finding a good thing and running with it. 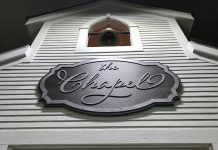 Once a small design and production firm of signage and POP materials for major oil companies, the Atlanta company was asked by an advertising agency in 1985 to develop a real estate sign for a local client. Today, they serve over 750 independent real estate companies and national franchises, including Century 21, Coldwell-Banker and Re/Max. Keeping up with customer demands requires dedicated and knowledgeable employees, reliable equipment and technology that separates you from the competition. That’s owner Brian Farmer’s philosophy and it is working. It’s also one reason why he made a decision to invest in a new 62-inch SABER® paper cutter with Microcut® electronics from Colter & Peterson. Farmer has history on his side, again. His father, Kenneth Farmer, started the business in 1980. Bryan began working there full time in 1989, then succeeded his late father as president of the company in 2010. The company’s back-up cutting unit is a smaller, 45-inch SABER unit, and his relationship with Colter & Peterson dates back nearly 15 years. Farmer has the right machine to do the job. The SABER line has earned a workhorse reputation for cutting the toughest materials, including many types of plastics at different thickness levels. A double bevel blade makes it all possible, leading to incredibly smooth cuts and high accuracy rates within 1-64th of an inch. “The new SABER cuts styrene, coroplast and vinyl for our yard signs. 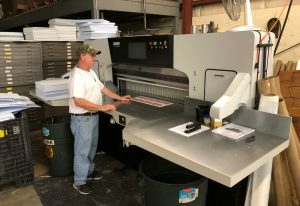 The largest signs we produce are 4-feet by 8-feet,” said Farmer, whose company does 75 percent of its business in Atlanta but services and ships product for its national accounts, mostly up and down the east coast. The majority of the work is for residential use but there is a commercial side of the business as well. Farmer said there is no average order size in his business, indicating it largely depends on the situation. 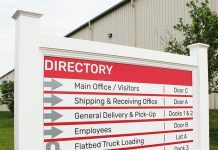 “When we did a complete makeover for Prudential after they were acquired by Berkshire Hathaway Home Services, we produced 4000 signs for them. Most of our corporate accounts usually order 25 signs. Those are silk screen jobs that are one or two-color and we run them on our two Saturn Platinum II flatbed graphic presses. “We have also boutique accounts that are agent oriented where they only need one or two signs. Those jobs are run on our HP Designjet 700 and HP 750c Plus digital printers. Then we use the SABER to finish everything,” he said, mentioning the work is performed on a regular, one shift schedule five days a week. In a service oriented business, Farmer appreciates the attention he has received from Colter & Peterson.